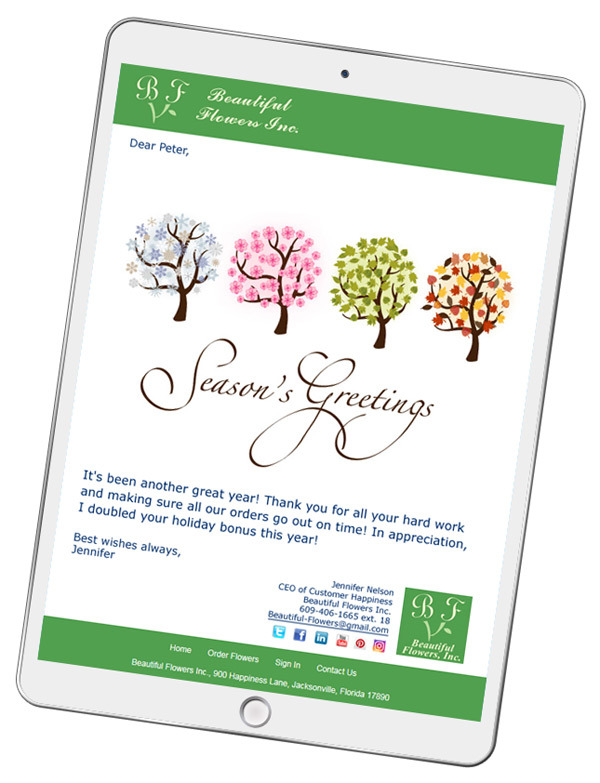 Whether you're the owner of a small business or a decision maker for a large company, here are tips for making the sending of holiday eCards a lot less stressful and ways to improve your business relationships all year 'round. Save Time, Save Money, Communicate Better...and more often! People can 'reply' to your eCard and click on links to your website or social media. That extra engagement strengthens the connection between you and your recipients. You can easily keep in touch well beyond the holiday season. 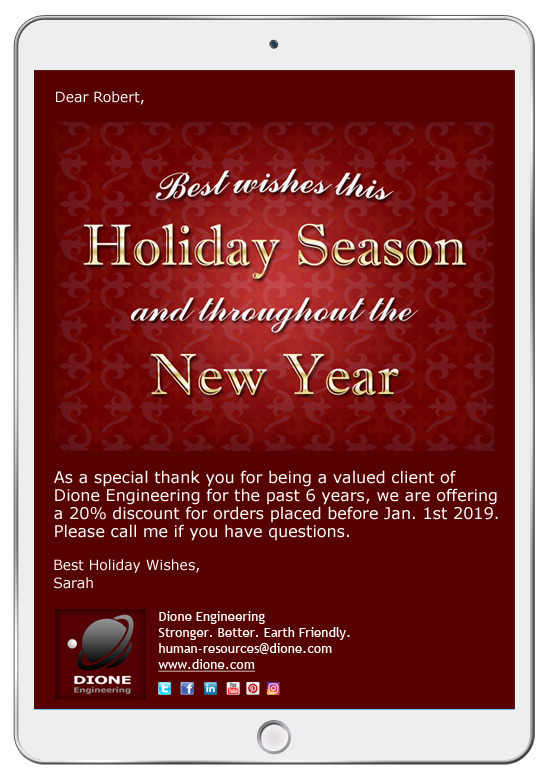 Once you clean up your email list (tips below) and send your holiday eCards, it is extremely easy to maintain relationships throughout the year with your coworkers, acquaintances and customers for many business occasions like birthdays, anniversaries, invitations, news announcements and thank you cards. You can post your eCards on your website and in social media. Easily extend your email marketing efforts to your website, blog and social media channels to further the interactive with customers and prospects. CorpNote provides unlimited online greeting cards, invitations and surveys for one fixed monthly price. This enables you to seamlessly answer all of your business communications and online marketing needs with one service. By having all of your contacts, art and correspondence history in one place, you can easily and affordably accomplish many important business tasks that would be daunting if you attempted them separately. Whether you are a beginner or a novice at sending holiday eCards, our guide has plenty of tips to not only help you achieve your goals but help you discover new opportunities you may not have thought about. You can begin with the first topic or choose the section that specifically meets your needs. This article contains tips for preparing your email list, keeping your email list up-to-date throughout the year, managing your contact's subscription preferences, building your email list for future email marketing campaigns and more. We've also included tips for making the most of your CorpNote Address Book including how to set up recurring holiday cards that can automate much of the holiday eCard sending process each year. Even if you are familiar with sending holiday eCards, these tips will help make the process easier and hopefully even better received by your eCard recipients. Topics include tips for designing a customized holiday eCard, how to use templates, how to share your eCards on your website and in social media, and how to track who's viewing your holiday eCards. From creating and sending your holiday party invitations to following up before and after the event, we're here to help! Just follow these tips for managing your invitation list, sending your invitations, monitoring responses, communicating with your guests and following up after the party. Holiday party planning has never been easier! Creating your own custom eCard imagery can make your message unique and memorable to your eCard recipients. You can even do it from your mobile phone. 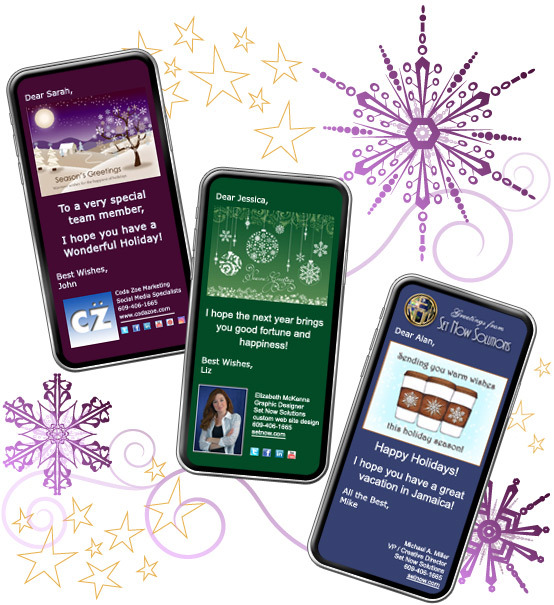 Here are tips for creating your own custom holiday eCards this season. 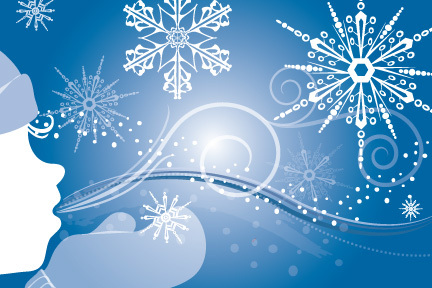 The holidays provide lots of business and personal networking opportunities. QuickSend eCards make it easy for you to quickly send a personalized follow-up eCard with your contact information in less than 30 seconds. There's no app to download and it is included with your membership. With CorpNote's Individual Membership plan you can customize your eCards, invitations and surveys with your company logo, colors, contact information and social media links. If you want even more branding opportunities, you can go one step further with our Multi-user Memberships or Single-user Memberships with our Custom Interface option. This enables you to make our website look like your company website and/or social media channels. Your custom-branded interface design will be visible to your recipients when they view your eCards, invitations and surveys. With our multi-user memberships, your company branded interface will also be visible to you and your users when using CorpNote.